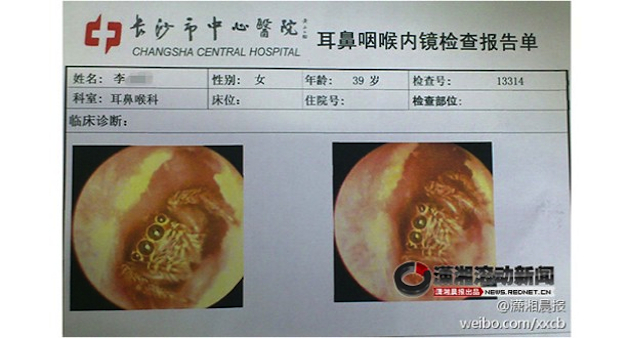 A woman who went to China's Changsha Central Hospital complaining of itching in the left side of her head was told by doctors that the source of irritation was a spider that had been living inside her ear canal for five days. The flushing technique was successful and the woman reportedly wept with gratitude after being told the spider was removed. Doctors say they believe the spider entered the woman's home while the home was undergoing renovations, and crawled into her ear while she was sleeping. "All insects are cold-blooded, so in extreme heat they develop quicker, which results in more generations popping up now compared to previous summers," Jim Fredericks, an entomologist and wildlife ecology expert with the National Pest Management Association, told the network.